It’s officially Spring! Although it might not look like it yet, the snow will soon melt away and yards around the neighborhood will finally be exposed. But after this harsh winter, what is left under that snow is not going to be too pretty, and will need a little extra help and TLC to get it looking beautiful again. Think of it as a blank canvas to create a stunning landscape masterpiece upon. So, what will your landscape design plans consist of for 2015? Well, here are some of the top trends in landscape to help inspire your design plans. There are two huge trends when it comes to garden landscape design this season, sustainability and low-maintenance, according to the 2015 Residential Landscape Architecture Trends Survey conducted by the American Society of Landscape Architects (ASLA). Our lives are busy and non-stop, and no one has the time to do all the things they need to get done in the day and take care of a high-maintenance lawn. Also, the green initiative and eco-friendly lifestyle have recently taken off and have had a huge influence on people today. So, it’s no surprise that many people are looking for a landscape design that is easy to take care of and that has eco-friendly elements. Take these two trends and add attractive features and elements, and you will have the makings of a beautiful landscaped yard. Here are some of these trendy features and elements that you can add to your landscape. Native/adapted drought tolerant plants – Native plants tend to need less fertilizer, water, pesticide, and overall care than plants that originated in other regions or climates, making them the perfect plants to use when designing a sustainable landscape. Drought tolerant plants also need less maintenance and will help save on the water bill. Food/vegetable gardens – Backyard gardening is eco-friendly in many ways. If you grow your food organically, without pesticides and herbicides, you’ll spare the earth the burden of unnecessary air and water pollution. You’ll also reduce the use of fossil fuels and the resulting pollution that comes from the transport of fresh produce from all over the world to your supermarket. Growing your own food will save you money on your grocery bill and save the planet. Rain gardens – Rain gardens look like any regular flower garden, but they allow rainwater runoff from impervious areas (roofs, driveways, walkways, parking lots, and compacted lawn areas) the opportunity to be absorbed. This improves water quality in nearby bodies of water and reduces rain runoff by allowing storm water to soak into the ground, as opposed to flowing into storm drains and surface waters which causes erosion, water pollution, flooding, and diminished groundwater. Plant perennials over annuals – Perennial plants save money and time. While annual plants only provide a season or two of beauty, perennial plants can last for years. Incorporate small numbers of annuals in planters or containers and place them where there bright colors will be noticed and fill large beds with perennials. This means fewer plants to buy in the long run and less time spent planting them. 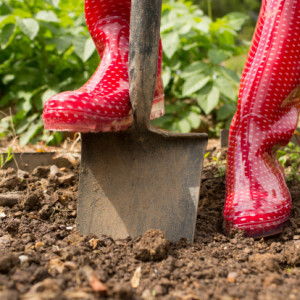 Mulching – Mulching can act as a weed barrier; it holds in moisture which reduces watering; releases nutrients into the soil; and improves the appearance of garden beds. Adding mulch to your landscape will save time weeding, watering, and is a lower maintenance option than grass and other materials. Hardscape – Laying pavers, tiles, concrete, stone or gravel for a patio or other yard feature reduces lawn area and produces a long-lasting surface that needs only occasional sweeping. Consider other uses of stone or gravel to reduce weeding and watering. Hardscape can add another dimension to your yard and give it great curb appeal, with little maintenance. These sustainable and low-maintenance elements can be incorporated into any landscape design and contribute to a beautiful and functional yard. Having a beautiful landscaped yard does not mean you have to spend hours every day tending to it or hurt the environment while doing so. By adding elements that keep sustainability and maintenance in mind, you can have an easy and eco-friendly yard to enjoy. If you would like to learn more about landscape design and how to make your yard beautiful this season, contact the professionals at Greener Horizon Landscape Management & Construction in Middleborough, MA. We would love to work with you!